Kerchner, J. (2014). 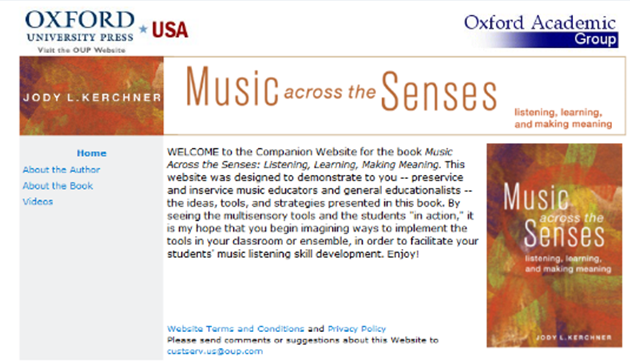 Music Across the Senses: Listening, Learning and Making Meaning. Oxford: Oxford University Press. 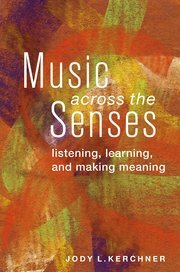 Music across the Senses – listening, learning and making meaning is one of those rare books that, theoretically presenting an in-depth subject - in this case 'listening' - brilliantly makes constant connections with practice, giving examples and very rich ideas to be developed in the classroom. All this is brilliantly grounded by the author in the first chapter, 'Principles and Foundations of Music Listening', in which she makes a very well-founded literature review, relating her main topic of study with a series of other concepts and conceptualisations, drawn not only from musical education itself, but also from philosophy or even from the field of neurosciences, as in the case of the references to the work of the Portuguese scientist António Damasio. In short, in a simple but not simplistic writing, in this first chapter, Kerchner guides us through several avenues that make us understand the phenomenon of listening in a global and integrated way, as an experience that includes feeling, thinking and intentional action, through a sharp and clear writing that includes exiting topics such as 'multisensory music listening', or 'create-ive music listening”. In the second chapter, and placing her work clearly within the constructivist paradigm, Kerchner elaborates a series of considerations about the educational process, that she addresses as a special encounter among students and between each student and her teacher, as a space of sincere communication and dialogue, that is possible only when teachers and students have the opportunity to experience a truly genuine pedagogical act. It is a chapter in which the author focuses essentially on general pedagogical considerations, calling teachers to reexamine their philosophies and their teaching and learning values, so that their professional practice might become, I would say, a real praxis, sustained in a constant reflection and evaluation of the teaching and learning processes. In this chapter Kerchner advocates for a philosophy of education that has its starting point in the student, in her thoughts, ideas and participation, pointing out some fundamental attitudes to be taken into account by teachers in order to make this process an effective one, and presenting a series of practical suggestions that might help teachers achieve to it. Still in chapter 2, Kerchner also shares with the reader a considerable amount of resources that teachers might use in their daily practice in the classroom, such as: 'questions that stimulate reflection and learning', 'ideas to be explored in the classroom', 'observation guides', a 'sample lesson reflection' and a 'sample teaching reflection' . rehearsal and performance (chapter 6). Each one of these chapters begins with a theoretical examination of the main concepts and ideas related to the specific mode of musical interaction that is being approached. These initial discussions, intended to frame the examples and suggestions of the practical activities that are described later, raise fundamental questions to teachers and researchers and are of crucial importance to fully understand the practical examples that follow. The examples given by the author refer to data from her own research and can not only be read, but also seen and listened to in the several videos made by Jody Kerchner during her research. The videos are available on the website that is linked to this book (see left), and that is (one of) the book’s greatest richnesses: By sharing with her readers live examples from k-12 students participating in listening activities designed by her, Kerchner transforms the book in a live interaction with her readers, and teachers and researchers have the opportunity to directly access, analyse and interpret several examples in which children and young people interact with music during different listening activities. The videos always begin with a description made by the author of what is going to happen next, and a reflection on some of the crucial moments of the video. 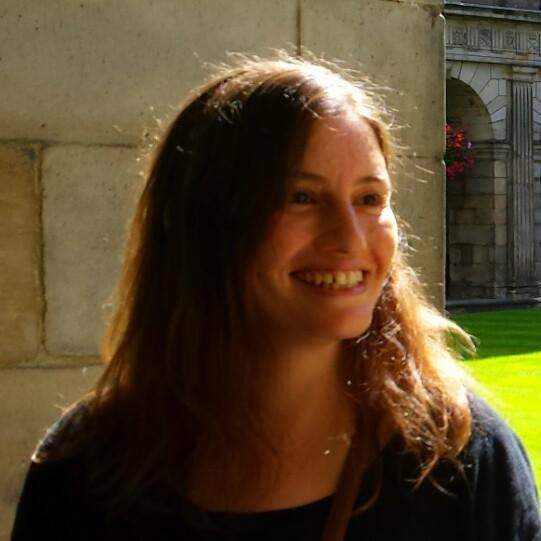 In my perspective, these videos are not only a mirror of what is described in the book, but also a way for the reader to empathise with the author, to establish a relationship that deepens the reader's benefits from this book and makes this work a real moment of dialogue between Kerchner and those who read her words. In the book, the author presents the description of each video and a detailed analysis of each example, with constant references to the literature review. After the examples, and at the end of each chapter, Kerchner focuses her thoughts on two main sections that make a fundamental contribution to the study and practice of music listening: A first one in which the author summarises the main contributions of her findings to the development of a music listening pedagogy that might be integrated on the main theoretical perspectives that cross the whole book, and a second one in which Kerchner introduces a list of strategies and tools that teachers might explore in their classrooms, using movement, visual maps, words and what Kerchner calls 'talk alouds', and performance activities. Closing the book is a very important chapter in which the author directs her attention towards evaluation and its procedures. In this last chapter (chapter 7) Kerchner begins by making an important distinction between evaluation and assessment. According to the author the purpose of evaluation is to 'compare the quality of student performance' through learning goals (…) provided by an external source, usually an authority figure such as a teacher, a set of national standards, or a testing agency'. On the contrary, assessment 'is an ongoing process that is non-judgmental, and noncomparative', developed in a 'collaborative effort between the teacher and individual students, which reflects those musical skills the students have and/or need to develop' (Kerchner, 2014, p. 183). After making this distinction and following her constructive perspective that encompasses the entire book, Kerchner provides several resources and tools for assessment within music listening activities, always within a circular logic of 'access-teach-access-teach' in which data collected from assessment will be the basis to (re) define new teaching strategies the might improve each student learning processes and outcomes. Finalising chapter 7, Kerchner introduces a section entitled 'Your turn', that aims to 'pass the baton' from Kerchner to all of us, teachers and researchers, after an outstanding journey of discovery and learning that the author so passionately shares with us. Ana Luísa Veloso (guitarist, graduation in music education, Porto College of Education, 2005, PhD in music education, Aveiro University, 2012) is a postdoctoral research fellow at the CIPEM where she has been developing several research projects in the areas of musical creativity, informal learning, and music, personal and social transformation. She is a member of the board of directors of the Portuguese Association of Music Education and director of the Portuguese Journal of Music Education.